Deb and Joe host two interviews of shows opening this week – Dr. Jason Dilly, the director of Stagecrafters’production of Fool for Love and Aaron Sohaski, the actor portraying Eddie in that show. They also spoke with Carla Margolis, Mama Rose in St. Dunstan’s production of Gypsy. 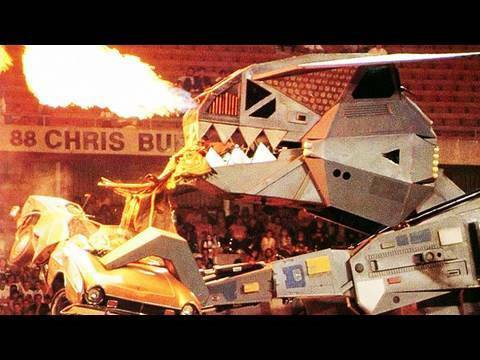 After Deb promoted the interview show in the echo fashion of a Monster Truck Show commercial, Joe continually expressed his admiration for Truckasaurus and hoped that he could be worked into more community theater shows. Deb and Joe interview Maureen Mansfield, director of Farmington Players’ production of Brighton Beach Memoirs. Deb and Joe let their dogs (Ginger and Puck) take over this week’s episode. They (Deb and Joe) interview Tom Arwady and Toni Harte, director and choreographer respectively of Ridgedale Players production of The Wedding Singer. Southgate Players – Audition – Lion King, Jr.
Deb and Joe celebrate the beginning of a third season of Front Row Podcast! They interview Tim Wittlinger, director of the Village Players of Birmingham‘s production of Rehearsal for Murder. FRP 041: Glengarry Glen Ross, Jr. This week, Deb and Joe decide to produce a junior version of David Mamet’s Glengarry Glen Ross, Jr. They interview Kori Bielaniec, director of the Players Guild of Dearborn’s youth production of Grease, along with several members of the cast. This week, Deb and Joe receive an Hanukkah / Christmas gift in June, when they discover that the Bill and Ted Trilogy is in pre-production. They can barely contain their eighties glee before welcoming Jim Territo, creator of The Daedalus 2 Mission: A Space Opera at Planet Ant Theater. Jim was joined by the director of the show, Rachel Biber. Disney’s Alice in Wonderland Jr. at Starlight Players – June 28 – July 1. This week, Deb and Joe interview three youth players of St. Dustan’s upcoming musical, Oliver. This week, Deb and Joe interviewed Ryan Moore, director of Avon Players – The Bridges of Madison County, May 18th – 20th, 25th – 27th, June 1st – 2nd. Village Players of Birmingham production of She Loves Me, runs May 18th, 19th and 20th, 2018. FRP 037: Would You Like Some Ice Cream With Your Meat Pie? This week, Deb and Joe discuss record the show in the middle of Joe’s final dress rehearsal for Sweeney Todd, The Demon Barber of Fleet Street at Richmond Community Theater. Joe interviews director Bryan Braun (who didn’t know Joe was recording a podcast during the final dress rehearsal). The show runs May 11th, 12th, 18th, 19th, 20th, 25th, 26th, and 27th, 2018. Village Players of Birmingham production of She Loves Me, runs May 11th, 12th, 13th, 18th, 19th and 20th, 2018. Joe interviews director Kevin Branshaw and leading actor Kathleen Duffy. This week, Deb and Joe discuss follow the acting career of Milky White, appearing in Into the Woods at Farmington Players. The Baker (Jason Wilhoite) and the Baker’s Wife (Wendy Krekeler) discuss this great production.